Sometimes I am just blown away by science. Like for instance, it still blows my mind that we have actually managed to get huge hunks of metal to fly through the air! And every time I fly in a plane, I am in complete awe of this. I know it’s just basic physics, but it still amazes me. And I have to admit that I was even a little amazed that my little chocolate cookie witch hats stayed afloat in this Melting Witch Halloween Punch! After all, it’s punch. I know ice cream, or sherbert in this case, floats on soda, but I’ve made far too many assumptions about food science and structure as a young and inexperienced cake decorator to get too cocky. But I was curious about the science behind this – why does ice cream float on soda? I just can’t seem to get enough of the melting witch theme this Halloween! 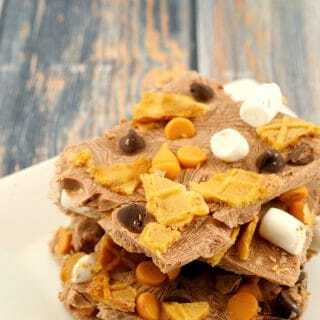 I recently made a delicious Melting Witch Chocolate Halloween Bark and it’s such a fun theme that I had to run with it and create at least one more recipe before Halloween! 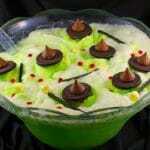 So, if you are looking for a spooky, fun and green Halloween punch (non-alcoholic), this melting witch punch is the one…. The reason that ice cream floats on soda has to do with density. You can read more about that HERE! I was simply thrilled that my little witch hats didn’t sink. In the past I have made many assumptions, even ones with the laws physics on my side, and I was still left sorely disappointed. My first gingerbread house was a good example. You can read more about that HERE. And then there was the time I tried to make an edible support system for a cake (I was a bit obsessed with everything being edible at the time). But however crazy it was, it should have worked. I made this punch for my daughter’s Guides Halloween party this year and it was a hit! 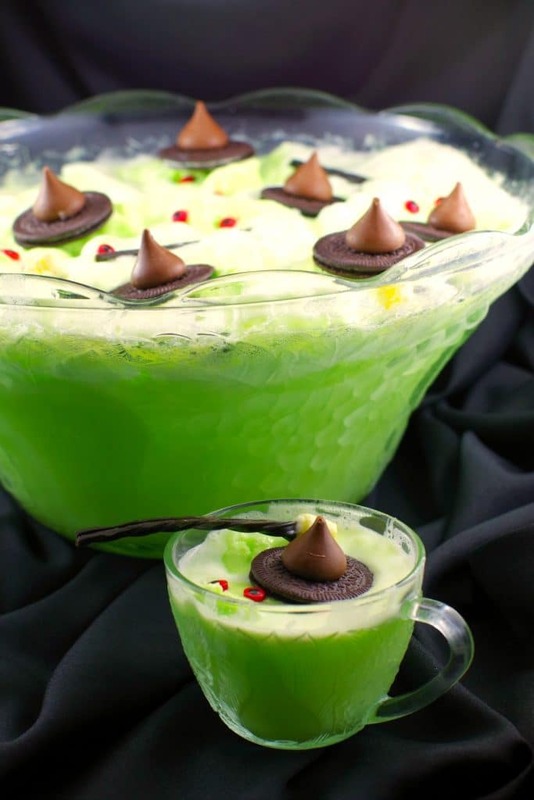 So, if you are looking for Halloween punch for kids, this recipe is what kids’ dreams are made of: ice cream, limade, soda pop, candy, marshmallows, chocolate and cookies! It doesn’t get much kid friendlier than that. And it’s perfect for a witch themed or Halloween party. I guess I should have been confident that if my fellow humans can get metal to fly through the air, I can certainly get chocolate cookie witch hats to float on punch. But after my past experiences, I take nothing anything for granted when it comes to food and science. 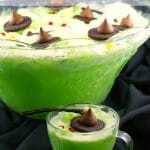 This green non-alcoholic Halloween Punch is the perfect Halloween potluck or witch themed party recipe, especially for kids! 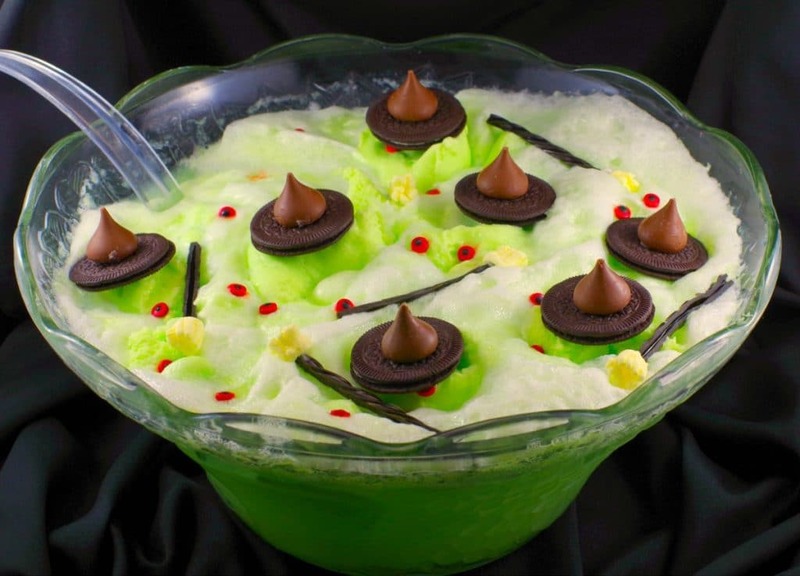 It has key lime Sherbert, soda pop, chocolate cookie witch hats, marshmallow licorice brooms and candy eyes. It's a kid's dream come true! Cut licorice in half, then in half again. Cut into broom using small scissors (reserved for food only) or cut with a knife. With icing “Glue" licorice to marshmallow (uncut end) with a dab of royal icing. Set aside. In a punch bowl, add sparkling water, soda (sprite or 7-up) frozen concentrated limonade and 1 container (946 ml) of key lime sherbert. Mix. Add scoops of sherbert to the punch (so it floats on top). Use about 1/2 a second 946 ml container. 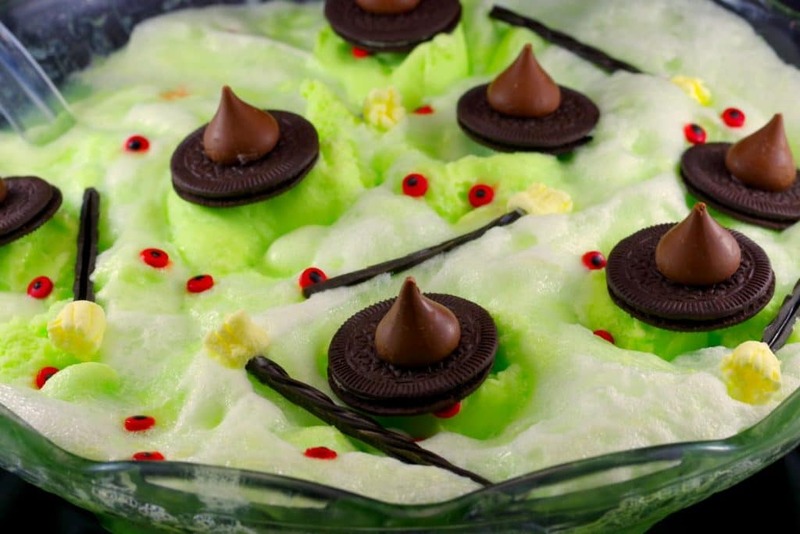 Place witch hats and brooms on mounds of sherbert, then add candy eyes. Serve immediately.